Astronomers and physicists study the material world and the energy that drives it, from the smallest particles like neutrinos and Higgs bosons to the very largest structures in the universe, and ultimately the universe itself. This program has a large overlap with mathematics, chemistry, biology, and engineering and can be approached from each of these angles. Astronomy is often considered a sub-field of physics in which principles of physics and mathematics are used to investigate the fundamental nature of the universe and its evolution; the properties of galaxies; and the birth, evolution, and death of stars and black holes. Astronomers apply this knowledge to solve problems in navigation, space flight, and satellite communications, as well as to develop the instrumentation and techniques used to observe and collect astronomical data. You can select a Major in Astronomy or a Double Honours Major with Physics. 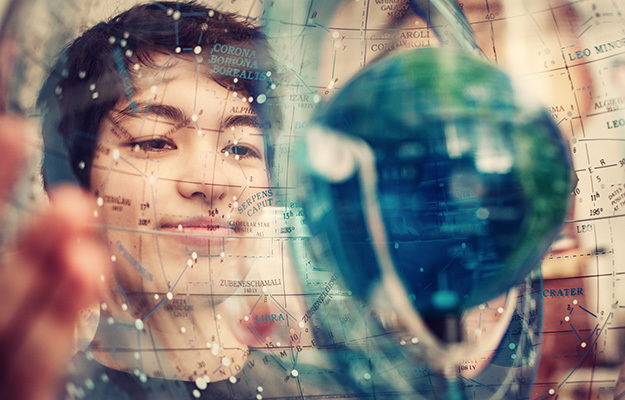 UBC has a very significant research program in astronomy and astrophysics, with several faculty globally acknowledged to be at the leading edge of cosmology research. UBC operates the Large Zenith telescope, the largest liquid mercury telescope in the world, located in one of UBC’s regional forests. General principles of the celestial sphere, laws of motion and light, optics, and telescopes; current knowledge of the Sun and Solar System. Modern stellar and extragalactic astronomy. Stars and stellar evolution from protostars to black holes; galaxies and quasars; cosmology. ASTR 200/205 rather than ASTR 102 are recommended for students who intend to pursue studies in Astronomy. Optics, electricity and magnetism, electric circuits, radioactivity, including biological applications. Please consult the Faculty of Science credit exclusion list: http://www.calendar.ubc.ca/vancouver/index.cfm?tree=12,215,410,414. Fundamentals of bonding theories and structural chemistry, with applications relevant to modern society. Measurement of positions, motions, and distances in astronomy. Temperature, masses, and spectra of stars. Hertzsprung-Russell diagram. Quantitative stellar structure and evolution. Chemical composition of stars in different Galactic populations. Globular and open star clusters. Stellar masses and evolution. White dwarfs, neutron stars, and black holes. Extrasolar planet formation and detection. Dark matter in the Milky Way and other galaxies. Cosmological observations and principles. Systems of linear equations, operations on matrices, determinants, eigenvalues and eigenvectors, diagonalization of symmetric matrices. Special relativity: Lorentz transformation, dynamics and conservation laws. Quantum physics: the experimental evidence for quantization; a qualitative discussion of the concepts of quantum mechanics and their application to simple systems of atoms and nuclei. Observations and basic characteristics of extrasolar planets, including their formation, evolution, and potential for supporting life. Not to be used to satisfy any Physics and Astronomy major or honours specialization requirement, but may be used as an upper-level science elective. A survey of recent discoveries in modern astronomy without the use of advanced mathematics. Stars, pulsars, black holes, galaxies, quasars and the origin and evolution of the Universe. Not open to first year students and not for credit in the Faculties of Science and Applied Science. Power series methods (ordinary and regular singular points, Bessel's equation); boundary value problems and separation of variables (Fourier series and other orthogonal series), applications to the vibrating string, heat flow, potentials. Experimental techniques of acoustics: data acquisition hardware and software, microphones, loudspeakers, noise, vibration and modal analysis. Introduction to the study of the Universe as a whole. Foundations of the Hot Big Bang model, the early Universe, nucleosynthesis, the cosmic microwave background, large-scale structure, galaxy formation and quasars. Radiative processes. White dwarfs, neutron stars, and black holes. Accreting systems. Gamma-ray bursts. Structure of planetary systems, planetary interiors, planet formation, planetary atmospheres, meteoritics, impact cratering. Principles and applications of statistical mechanics. Ideal gases, degenerate Fermi gases, Bose-Einstein condensation, black body radiation, fluctuations and phase transitions. Find out what you can do with your Astronomy major. "My goal is to get a PhD after my master's. I'd love to work with NASA or just do research for a while, but I’d also like to do academia eventually. Dr. Matthews has given me so many opportunities, and established contacts for me with scientists around the world. I’d like to 'send the elevator back down' and be able to do that for my own students one day."